The Nissan Leaf is a flexible vehicle. While Arizona Leaf owners complain of overheated batteries, new variants of Nissan’s electric hatchback keep cropping up. First the Portuguese government purchased five Leafs to use as police cars. Now, hotel guests in Nashville, Tennessee are being chauffeured in a Leaf stretch limousine. Imperial Limo Land of Springfield, Missouri is responsible for this eco-friendly limo. The company stretched a Leaf from its stock length of 175 inches to 223. Limo Land has been working on this project since the Leaf went on sale last year, and the first Leaf limos are being delivered to customers this week. Like most limos, Limo Land stretched the Leaf by cutting the car in half and adding a section in the middle. Before it could do that, the Leaf’s floor-mounted battery pack had to be removed. Because of the four-foot section added to the middle, the pack now sits further toward the rear of the car than it did before. To fill up the extra space inside, Limo Land replaced the stock Leaf’s rear bench seat with two rows of seats that face each other. The stretched Leaf seats seven passengers, plus the driver. Limousines are usually luxury vehicles based on Cadillacs, Lincolns, and Mercedes-Benzs, so Limo Land needed to give the Leaf some class, and nothing says class like a wood-paneled bar/drinks cabinet and a vinyl roof. The bar will make the Leaf a good tool for shuttling partygoers between clubs, and the vinyl roof (white, to match the body) will hide creases formed by the stretched body flexing. 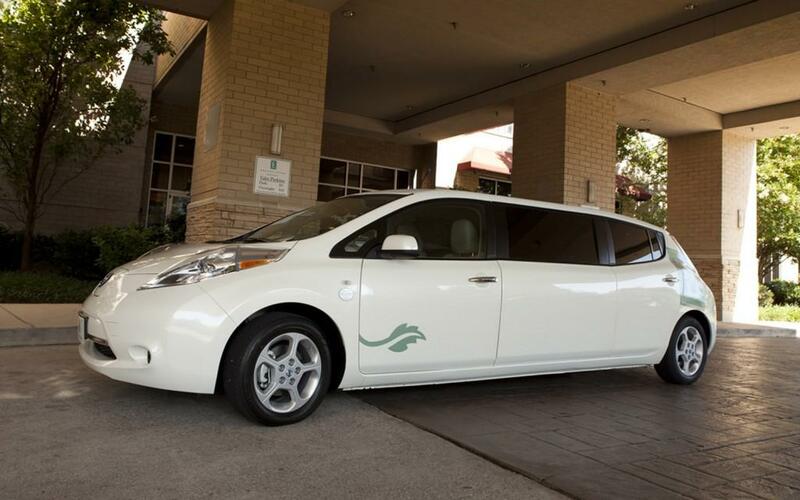 One of the first customers to get a Leaf limo was the Embassy Suites in Nashville. The hotel plans to use the Leaf for VIP transportation. Nashville is just a stone’s throw from the Smyrna, TN plant where Nissan plans to build Leafs for the U.S. market. Limo Land may turn one of those U.S.-grown Leafs into an even longer limo. That super-limo would probably be more like a bus, and could require extra batteries and more horsepower to get it moving. The four-foot stretch added 400 pounds to the Leaf. Most professional vehicles are based on existing designs, but with so few electric cars on the market, the Leaf is becoming a jack-of-all-trades. Conversions like this limo will show the advantages (or disadvantages) of using electric propulsion for things other than commuting and family vacations. Unlike the average commuter’s car, a taxi, police car, or limo spends all day on the road, so this could become an important area for electric vehicle development. If the Leaf wasn’t an EV, no one would ever think to turn it into a limo. However, with those batteries and electric motor, the sky is the limit. What will the Leaf become next? A fire engine? An ice cream truck? It could be anything.